I creep into the Halloween spirit by watching glimpsing at horror and thriller movies on television. While multitasking, I peek through my fingers once in a while to see what mayhem has arisen. I’ve seen zombies, one of the Scary Movie series onslaught and one scene from Friday the 13th complete with Freddy Kruger. When flipping through the channels the other night, I stumbled upon one of my very favorite Halloween comedies – Addams Family Values. The lines were poetic, the quips unrelenting, and the cast replete with Angelica Huston, the late Raul Julia, Joan Cusack, Christina Ricci and Christopher Lloyd had me laughing out loud. I have always loved these deathly, creepy, and wonderfully morbid characters. Gomez laments about the lack of communication with his brother Fester. Gomez: I would crawl on my belly through hot coals and broken glass for him. Do you remember our honeymoon? So do you still desire me after all these years; the old ball and chain? There were two other Addams movies created in the 1990’s; The Addams Family and Addams Family Reunion. All three were based on the cartoons drawn by Charles Samuel Addams. My father who is also an artist introduced me to his work long ago, so I decided to delve into a little research. Addams was born in 1912 and grew up in Westfield, New Jersey. He was caught breaking into a house much like the one in the Addams Family and a skeleton drawn on the second floor is attributed to him. He was especially fond of visiting cemeteries. Addams wrote The Addams Family series for television in 1964. Along with the aforementioned movies, it inspired two TV cartoons and a Broadway musical. One of Addams’ first gigs was touching up photos of corpses in True Detective Magazine. He found the bloody photos more interesting before he worked on them. In the 1930’s he became a cartoonist for the New Yorker, Colliers and TV Guide magazines. Alfred Hitchcock included him in his movie, North by Northwest with the line, “The three of you together. Now that’s a picture only Charles Addams could draw.” They must have been like old grave-digging friends. He drew over 1300 cartoons in his lifetime and is considered one of the top American cartoonists of the 20th century. Addams published several anthologies of his cartoons as well. Addams was married three times. Two of his wives resembled his character Morticia. His first wife divorced him because he hated children and wouldn’t adopt. His second was a lawyer and tried to take over his fortune. He divorced her after seeing red flags when she took out a million dollar life insurance policy on him. He married his third wife in a pet cemetery and then moved into their estate fondly called The Swamp. 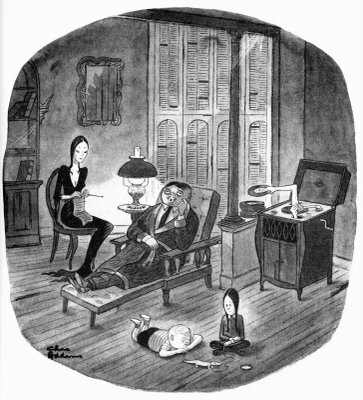 Which character did Charles Addams relate to the most? Was it the matriarch of the family, Morticia, the beautiful vamp whose penchant for dark humor and snipping rose buds seems to outweigh any concern for her children? Or did he love Gomez best as the cigar-smoking stockbroker father with a love of blowing up model trains. His oily back black hair set off a bloodless face. Was it their relationship that he longed for? When Morticia speaks French, Gomez replies in Italian, “Cara Mia” (my beloved), and kisses her long slender arms. Was he fascinated by Grandmama, Morticia’s mother, who tries out new experiments in witchcraft? Did he love Uncle Fester who always seems to get into trouble while playing around with electricity? He makes a great light bulb receptacle. Was his favorite Wednesday, Gomez and Morticia’s brooding daughter, who is fixated with death or her older brother Pugsley? The siblings can usually be found conspiring to “off” someone or each other. Addams may have found Lurch the butler the most lovable as he towers over everyone. His Frankenstein-esque appearance is reinforced by groans and eye rolls. Thing, the hand, gives new meaning to the words “body language.” Cousin Itt makes occasional appearances. This furry creature has a lot of energy while wearing sunglasses and a top hat. The girls really go for Itt. My guess is that Addams had several favorites and enjoyed writing about this highly unusual and macabre family. They always survive the lovely, dark, and disturbing day. Set inside a haunted house to “die for,” this is a cast of characters no one would like to meet in a dark alley. I have almost died laughing at their droll humor. Sorry. I couldn’t resist. Charles Addams died in 1988, but his dream of the quirky family lives on. His ashes were buried in his pet cemetery at The Swamp. 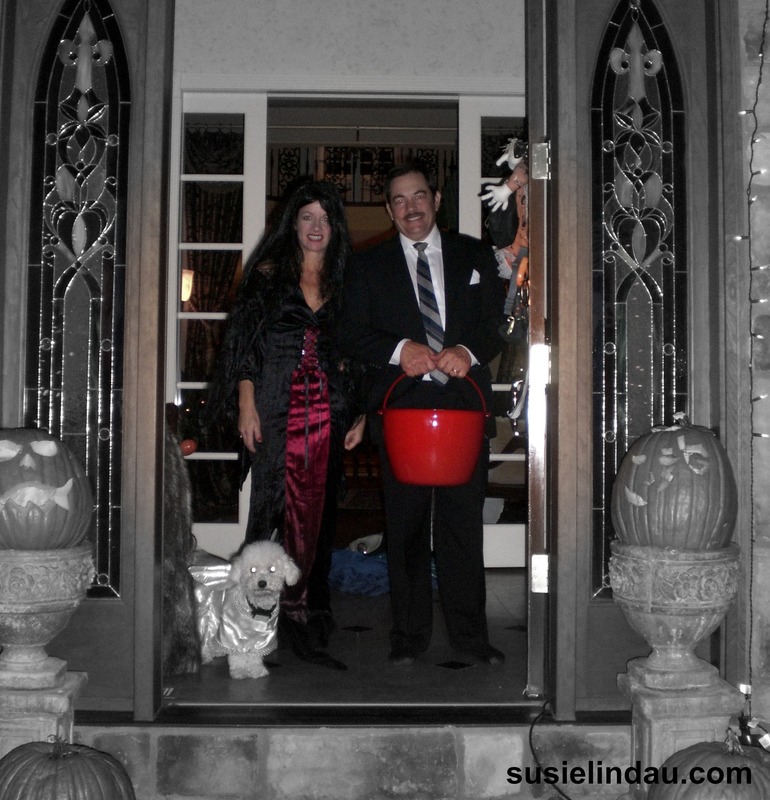 We’ll be waiting for you….Happy Halloween! What is your favorite Addams Family Character? World Book Encyclopedia: Cartoonists. I know. I still have a set! You Got This! You Can Do This! You have a sister? and a twisted one at that’? oh do define ‘twisted’ Is that like left hanging hand cuffed and ankle shackled to a Chandelier like a Pinata? Ha! Morticia is my imaginary sister. My sister, Patty, isn’t half as twisted, but she’s a lot of fun too!